It’s an era of Mass Surveillance, where Encryption has become more important today for all of us than any other time in the History. But the trouble is that Crypto programs are too hard for Non-Internet-Savvy to implement and use. Time is loudly announcing the need to switch to some alternatives that provide end-to-end encryption for communication between two devices in order to keep your personal data away from NSA's prying eyes and respect your Privacy. But, many services, including Facebook's messaging application, don’t support encryption and therefore are weak in providing security of our online data, which could result in data breach either by cyber criminals or by our own Government under surveillance programs. Because Facebook's messaging application doesn't support end-to-end encryption, an Open-source and most popular crypto chat-encryption application called 'Cryptocat' has made it possible to chat with your Facebook friends and relatives over an encrypted environment. Cryptocat is a tool that allows secure and encrypted chat which is easy and accessible for everyone. The app is well known for bringing encrypted communications to the masses and is very popular among human rights activists and journalists around the world. In General, The Facebook Inbox Messages or Chat between the two are protected by Secure Sockets Layer (SSL) encryption over HTTPS Channel, but the problem is it only encrypts data between user and Facebook, but the company has access to the plain text of those conversations directly from their database, which potentially could be provided to law enforcement authorities under certain circumstances or court orders. Felt the need of encrypting chats for roughly 1.2 billion Facebook users, Cryptocat has announced its latest update which includes the full encryption for Facebook inbox messages. “Cryptocat’s mission is to make encrypted chat accessible and easy to use. With Cryptocat celebrating its third birthday (already! 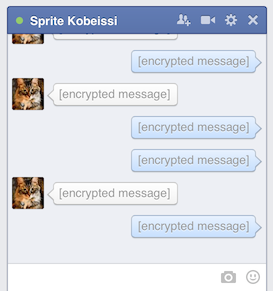 ), we're happy to announce the new Encrypted Facebook Chat feature in the latest Cryptocat 2.2 update,” Cryptocat's founder, Nadim Kobeissi wrote in a blog post. Finally, Cryptocat solves the half of the Privacy related problem by offering end-to-end encryption between the Facebook users over Chat. Cryptocat application uses the Facebook account APIs to work. If two individuals are using Cryptocat for chatting, Facebook will only know who is talking to whom over an encrypted conversation and when. But, it doesn’t allow Facebook or any other server, including Cryptocat’s own, to see the users’ plain text messages -- that's the beauty of end-to-end encryption technology. "There's no harm in Cryptocat using this already-given metadata to allow these users to set up encrypted chats," Kobeissi wrote. "The usability benefits of being able to quickly see which friends are online and ready for an encrypted chat remain overly substantial for those users." But Facebook couldn’t digest this news and the social network giant has made clear its intention of shutting down its Chat API/XMPP Services by April 30th 2015, so you have almost a year to enjoy Cryptocat encryption for secure chatting with your Facebook friends. Cryptocat 2.2 with Encrypted Facebook Chat is already available as a browser extension for Chrome, Safari, and Opera and as an iPhone app for Apple iPhones, whereas Android is on the way. Also by the end of this week, the updates will be available for Firefox and Mac desktop as well. So, almost anyone can download Cryptocat and start chatting with friends.